North Texas is blessed to have many nice, sunny days throughout the year. When you’re enjoying the outdoors, entertaining friends and family, it’s ideal to have a great place to cook and serve drinks without having to go in and out of the house. Consider the grill and bar in the picture. These are the type of outdoor kitchens that Ideal Landscape has constructed for our customers in the past. This client chose to have a grill, but we can add burners, a griddle, broiler or more, depending on what you think you’ll need. Such a kitchen can be readily supplied with gas, electric and water and make it easy for you to maximize your enjoyment of your outdoor oasis. Such kitchens are often located poolside, making it a great place to enjoy nice weather. We can even include a fire pit, or fireplace, depending on your preference, and how you think you’ll utilize your space the most. Our designs typically incorporate wood, stone and sturdy construction. They’ll withstand the elements when it’s not-so-nice outside, and be ready for you when it is. Our design team has an eye for materials and we can make outdoor kitchens that blend well with your existing home decor and style. We’ll be sure to include your input into this process to ensure that we achieve the goal of you saying “Wow!” when it’s all done. Our team includes building, electrical and plumbing experts so that our finished products meet the requirements of any prevailing building codes and ordinances. We want to make sure that any outdoor kitchens that Ideal Landscape installs work well in addition to looking good! As we put together the design, we’ll talk through how you would plan to utilize this space, to make sure we recommend the right cooking equipment and electrical needs. You may even want to consider having a refrigerator included in the plan so that snacks and beverages are cool and fresh when you want them. Call us at Ideal Landscape Design today, and we’ll be happy to dream with you! Outdoor kitchens are one of our specialties. 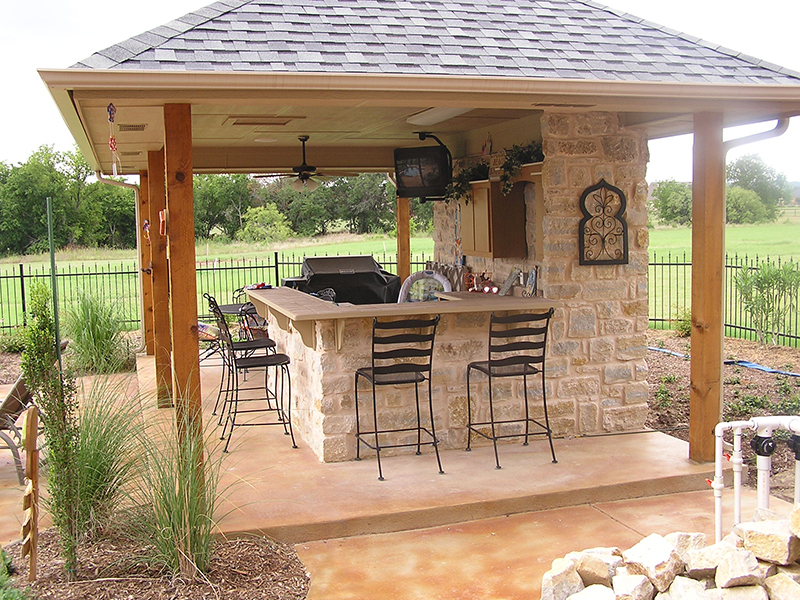 Call us today at 817-457-7507, and we can capture your dream and make your backyard oasis a reality!